Known as the Lora in Papiamentu, the Yellow-shouldered Amazon (Amazona barbadensis) is a beautiful parrot that has a special place in the heart of many Bonaireans. It is named for the distinct yellow patch on its “shoulder” (the crease of its wing), and had a bright green plumage over most of its body. They typically mate for life, and their nesting season is from May-August. They lay eggs in cavities trees and cliffs, where the female guards the clutch while the male provides food for her and the chicks. Although the Yellow-shouldered Amazon is often confused with the Brown-throated Parakeet (Aratinga pertinax) you can distinguish by the following features: it had large average body size of ~33cm (13”) compared to the ~25cm (10”) parakeet, it has a deep green underbelly while the parakeet’s is typically yellow-green, and the Yellow-shouldered Amazon has red and blue feathers on tips of its wings. The Yellow-shouldered Amazon is native to Bonaire, Sint Eustatius and Saba, and Venezuela, but is locally extinct on Aruba and Curacao. Sadly, these parrots are becoming less abundant due to illegal poaching for the pet trade and habitat loss caused by historic deforestation by humans and present day deforestation by invasive goats and donkeys. 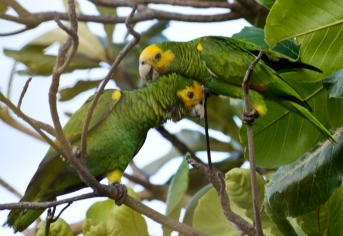 The IUCN Red List lists the Yellow-shouldered Amazon as Vulnerable. In response, from 2006-2008 STINAPA worked to reforest Klein Bonaire with native plants, with the hope to restore habitat for the Yellow-shouldered Amazon and other local birds. In 2007, STINAPA restored the fence around Washington-Slagbaai National Park to exclude invasive goats. These birds are protected under island legislation. The local NGO Echo,, established in 2010, also works to protect and research the Yellow-shouldered Amazon, reforest the area with native plants and increase community awareness about their importance.